. índice . Prefacio . Preface . . aguas . 1 . 2 . 3 . 4 . 5 . 6 . . contamina 1 . 2 . 3 . 4 . 5 . 6 . . holocausto 1 . 2 . 3 . 4 . 5 . 6 . 7 . 8 . 9 . 10 . 11 . 12 . 13 . . lineas 1 . 2 . 3 . 4 . . hidrotermias 1 . 2 . 3 . 4 . 5 . 6 . . nuevas 1 . 2 . 3 . . Reconquista 1 . 2 . . hidrogeo 1 . 2 . 3 . 4 . 5 . 6 . . esbozos 1 . 2 . 3 . 4 . 5 . 6 . 7 . 8 . . corredorcentral 1 . 2 . 3 . 4 . 5 . 6 . . cordones 1 . 2 . 3 . 4 . 5 . . epiola 1 . 2 . 3 . 4 . 5 . 6 . . deriva 1 . 2 . 3 . 4 . 5 . 6 . 7 . 8 . 9 . 10 . 11 . 12 . 13 . 14 . . archivo 1 . 2 . 3 . 4 . . Halcrow 1 . 2 . 3 . 4 . 5 . 6 . . frentehalino 1 . 2 . 3 . 4 . 5 . 6 . 7 . 8 . . emicampanaoculto 1 . 2 . 3 . 4 . 5 . 6 . 7 . . Costa del Plata 0 . 1 . 2 . 3 . 4 . 5 . 6 . . Costa del oro 1 . 2 . . IRSA 1 . 2 . 3 . 4 . . flujos . . segmentos . . pendientes 1 . 2 . 3 . 4 . 5 . 6 . . delta 1 . 2 . 3 . 4 . 5 . . propuesta . 1 . 2 . . correconvectivo 1 . 2 . 3 . 4 . 5 . 6 . 7 . . plataforma 1 . 2 . . termodinamica 1 . 2 . 3 . . Sagoff . . ABL 1 . 2 . . congreso . . girh . . Acumar 1 . 2 . 3 . 4 . . evaluacion 1 . 2 . . BocaRiachuelo 1 . 2 . 3 . 4 . 5 . 6 . 7 . 8 . 9 . 10 . 11 . 12 . 13 . 14 . 15 . 16 . 17 . 18 . 19 . 20 . . StoDomingo . . urgenciasatadas 1 . 2 . . inundabaires 1 . 2 . 3 . 4 . . sinsustento 1 . 2 . . emisarios 1 . 2 . 3 . 4 . 5 . 6 . 7 . 8 . 9 . 10 . . UAG 1 . 2 . 3 . 4 . . áreas nuevas 1 . 2 . 3 . . acreencias 1 . 2 . 3 . 4 . 5 . . audiencia 1 . 2 . 3 . 4 . 5 . 6 . 7 . 8 . 9 . 10 . . Valls 1 . 2 . . contrastes 1 . 2 . 3 . 4 . 5 . 6 . 7 . 8 . 9 . 10 . 11 . . convexterna . . playas 1 . 2 . 3 . 4 . 5 . 6 . 7 . 8 . 9 . . Plan Maestro 1 . 2 . 3 . . Parque Norte . 1 . 2 . . ribera . 1 . 2 . 3 . 4 . 5 . . jurisdiccion 1 . 2 . 3 . 4 . 5 . 6 . 7 . 8 . 9 . 10 . 11 . 12 . . CSJNpisamr 1 . 2 . 3 . 4 . 5 . 6 . 7 . . zonas muertas . . Bermejo 1 . 2 . . Pilcomayo . . Uruguay 1 . 2 . . Paraná . 1 . 2 . . Asunción 1 . 2 . 3 . . Areco 1 . 2 . . Salado . . Samborombon . . Atalaya 1 . 2 . 3 . 4 . 5 . 6 . 7 . . PuntaPiedras . . Tuyú . . PuntaRasa 1 . 2 . . PuntaMedanos . . Mar Chiquita 1 . 2 . 3 . 4 . 5 . . Mar del Plata 1 . 2 . 3 . 4 . 5 . . Necochea . . Colonia . . MartinGarcia 1 . 2 . 3 . . montesdelplata . . botnia . . Puertos 1 . 2 . . formula1 . . disocio 1 . 2 . . senderos . . bajante . . . . oceano 1 . 2 . 3 . . hidrolinea 1 . 2 . 3 . . sustentable. 1 . 2 . . agua 1 . 2 . 3 . . hielo1300 . . antarticflows . . antarticmelts . . derrame . . luna 1 . 2 . 3 . 4 . 5 . 6 . . Trinidad . . prospectivas . 1 . 2 . 3 . 4 . . SantaCruz . 1 . 2 . 3 . . volcanes . . ley particular . . baires2060 . . aereadores . . Guaire . . marpampeano 1 . 2 . 3 . 4 . 5 . 6 . 7 . . tamesis . . viajesedextra . . arena . . hospedero . . index . Granular materials, such as sand, behave in a surprising way. They can flow like a liquid, yet carry weight like a solid. Researchers employ photographic techniques to study this behavior in a two dimensional model system. They use transparent disks made of photo-elastic material that changes its optical properties when subjected to a force. Images like this one reveal the otherwise hidden and intricate force network between the particles and continue to give surprising new insight into the interesting behavior of something as common as sand. This work was performed at the Center of Nonlinear and Complex Systems at Duke University. This image was awarded first place in the "Envisioning the Invisible" 2010 Mahato memorial event photo contest, organized by the engineering graduate student council at the Pratt School of Engineering at Duke. The event, which will be annual, honors Abhijit Mahato, a former Duke engineering graduate student who was tragically murdered in 2008. Further information about the contest and pictures of other winning entries and submissions is available Here. [Research supported by National Science Foundation grants DMR 09-06908 and DMS 08-35742.] (Date of Image: September 2010). 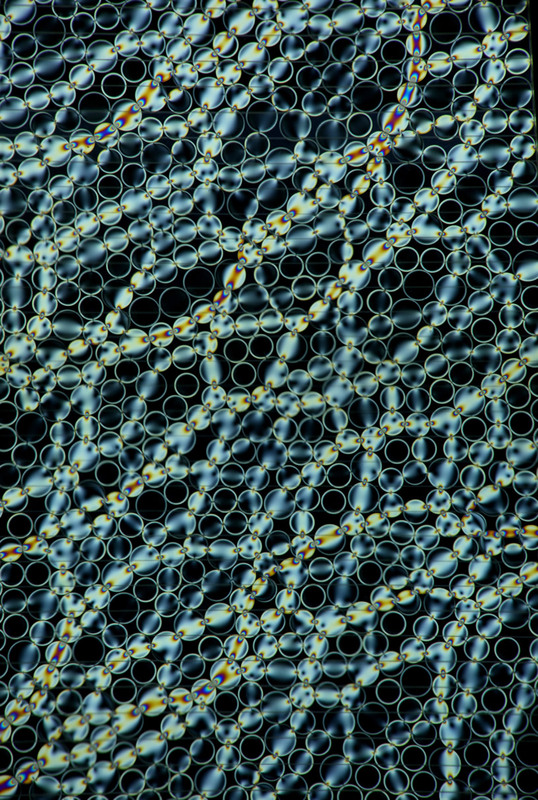 Credit: Jie Ren, Joshua Dijksman, Robert P. Behringer; Center for Nonlinear and Complex Systems, Duke University.